What happens when the technological magic of a theater piece eclipses the theatrical magic? That's the question that swirled through my head as I watched Helen Lawrence, Stan Douglas' film noir theater piece at UCLA. In many ways, Helen Lawrence is more of a piece of live cinema than a work of theater. As you enter Royce Hall at UCLA you see what looks like a projection screen separating the audience from the stage. It feels as if you're about to see a film projected. When the production begins that screen becomes semi-transparent. At times, it shows a complete projected image that fills the space. The screen alternately reveals the actors and the stage space behind it. The stage itself is something of a green-screen movie studio -- you know the technique where they film an actor in front of a colored screen and then substitute a different background to create a composite image? Imagine a theater stage with floor to ceiling solid color flats creating the backdrop. Now, picture those flats a deep blue and you've basically got the stage set for Helen Lawrence. What happens in front of that backdrop -- and behind that movie screen -- is the filming and acting of a 90 minute projected film noir. Our story is set in a seedy city following World War II and it has all the familiar film noir characters. We've got a crooked police chief, we've got working girls trying to make a buck, a bookie, a dilapidated old hotel and of course gorgeous, shadowy black and white scenes. What you're seeing as the story unfolds is a group of actors filming basically a three camera live film shoot. The actors alternately acting in front of and moving the cameras and those blue flats are swapped out for black and white scenic backdrops - all in real time. As a piece of technological wizardry it's astounding. As a piece of noir cinema it's convincing. As a piece of theater . . . that's a little more challenging. It may seem too obvious to even say but the thing getting in the way of the theater is the movie screen. From the audience you're separated from the actors by that semi-transparent screen. You always have to look through that screen to see the actors. And while the composition is striking with an actor framed beautifully in a black and white projected image, onstage the actors seem a bit distant and dwarfed by their surroundings. 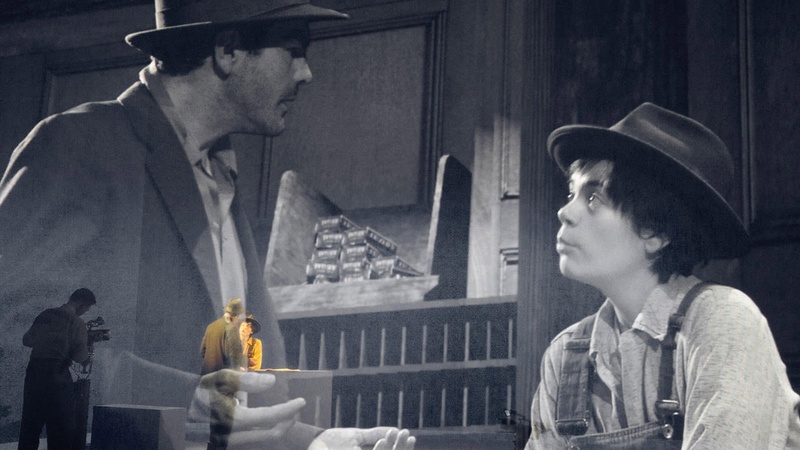 There are moments when the composite image takes on a third dimension where the live actor is framed by a projected giant image of that actor captured in black and white. But mostly I found myself ignoring the "live" actors on stage in favor of the giant projected image. After all, how can a six-foot tall actor compete with a 20-foot tall close up? Helen Lawrence becomes a bit of a cautionary tale for the theater. Now that the technology exists to create complicated composite images in real-time, we will no doubt see it more often in the theater. It's an offer too tempting to avoid: dazzle an audience with film magic. But if the finished product could just as easily be watched on Netflix, we've robbed the theater, and its actors, of its innate power.